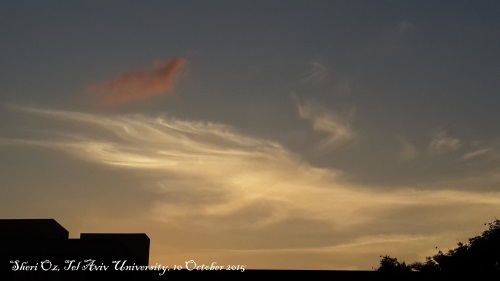 The time between marvelling at the white and red tufts of clouds shining at me as the sun set behind rooftops on the University of Tel Aviv campus and making my way along Ben Gurion Boulevard in Haifa to observe a right-wing demonstration was no more than two hours, but the two seem to occupy parallel universes. During the drive home to Haifa the radio caught me up on the news I had missed while looking after my granddaughter and that’s when I learned about the rally. According to Walla News, the demonstration took place under the slogan, “Jewish blood is not cheap”. Taking care of a child cuts you off from the rest of the world in the most satisfying of ways. Nothing matters but laughing at two cats playing on the grass, the taste of freshly cut fruit, and a hug by sweet little arms. Leaving child and mother, then, left a vacuum that allowed the “important matters of the day” to quickly wash over me like high tide on a wide flat beach during a storm. I didn’t HAVE to listen to the news; I could have turned on the classical music station instead. But I have this unrelenting need to know what is happening in the country I love so much. Circling the roundabout at HaMeginim that was barricaded on one side by the police, I easily found parking in an adjacent lot. That surprised me as I had anticipated traffic jams and a lack of parking spots. I should have known that this hinted at what I was about to see. In seconds I was on the other side of the barrier walking up the road that leads to the Bahai temple, the most famous landmark in Haifa. The street was almost empty. This is a popular spot, lined with restaurants, and I am used to seeing it teeming with pedestrians. 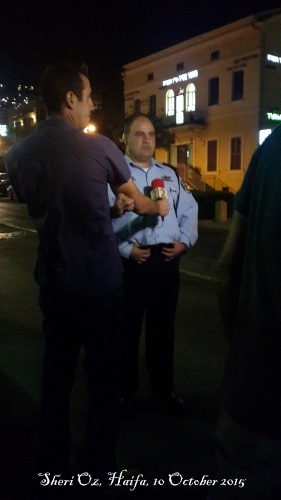 Standing in the middle of an empty traffic lane, the TV crew from Israel’s Channel 2 waited patiently with Interim Police Commissioner Bentzi Sau who was to be interviewed live for the evening news broadcast. He stared intently at the camera in front of him, as if his eyes were blinkered like a workhorse, and then the first question came. He listened. He answered steadily, confidently. But I couldn’t understand why he was blaming the recent wave of terror on the Arab’s apparent belief that Israel was going to change the status quo on the Temple Mount. That was just their excuse. And anyway it was not true. Why was he repeating that as if that was the real reason Arabs were throwing rocks at us Jews and stabbing us in the street? Disappointed that he added nothing new to the discussion, I continued on up the road when he moved away from the lights of the camera and removed the earphone. I stopped by a waiter who was leaning against the gate to the outdoor seating of his restaurant to ask him about the lack of diners. I could have stopped at any of the restaurants along the way – waiters were milling about chatting among themselves. In some places all tables were empty; in others only one or two tables were taken. The only restaurant patio that was filled to capacity, or at least looked as if it was, was that of the Colony Hotel. I wondered if dinner was included in the price of the room. The waiter told me that the street was empty tonight only because of the demonstration. It was not because of the general situation, he said, the terror had not kept people away. But the demonstration did. Now as I write these lines, I wonder if it was only the demonstration, or perhaps also the fact that within the hour the Israel-Cyprus qualifying soccer match was to begin at Teddy Stadium in Jerusalem and people were watching at home, safe. Police officers and soldiers were standing in twos and threes, evenly spaced along both sides of the road and on the island between the two lanes. Some were watching the thin trickle of people walking by and others seemed to be passing the time in nonchalant banter. Suddenly two young men and a woman strode up the road, holding an Israeli flag high in the air and singing an Israeli song. Nobody paid them much attention. Four huge police horses stood in the center of the road at the corner of Allenby and Ben Gurion where Arabs had gathered to chant in Arabic on both sides of the street, I think. The only sign I saw was in Hebrew and it said: “Haifa is for everyone”. Now I realize what a poor journalist I am – I didn’t speak to anyone, didn’t ask the woman holding the sign who she is nor what she was protesting. Now I am wondering whether or not she is even an Arab. I was overwhelmed, I think. And what I most remember is how the horses’ heads and eyes were covered with bulletproof transparent masks. Now another few people walked past the Arabs at the side of the road, holding Israeli flags and singing in Hebrew and you could hear boo’s accompanying them. They were barely louder than a whisper relative to all the various noises that were audible. Perhaps not even totally enthusiastic boo’s at that. But the fact that citizens of this state boo the flag and songs of love for the country is kind-of depressing, I think. Finally I reached the actual official demonstration. Here another four horses faced the few dozen demonstrators standing behind a waist-high portable barrier stretched across the road. The lit-up garden and Bahai World Center formed a backdrop to the Israeli flags and chanting crowd. I remember hearing “Abu Mazen is a homo” repeated several times before I decided to turn on my cellphone video recorder. I can’t figure out what that might have to do with anything. It sounds rather childish, like taunting you would hear at the school yard at recess. (3) remember to take a pad and pen to write down the answers to those questions because your memory has turned into a sieve (although I do seem to hold on well to the emotions and sensations I experienced). All photos and the video are my own. I think you did an excellent job. The best is that one can get an honest, untwisted view of the event. I think that is the true sign of a great journalist. Give the facts, be there for us, let us decide what we think, and if you express your feelings and opinions, you let us know that. I love the personal touches and so agree with them, grand babies etc. Well done. Thank you. Thanks for taking the time to read and I especially appreciate you taking the time to comment. Glad you like my mix of the personal with the events. Well observed. This is how real history is written. I love the analogy to the schoolyard. I feel an immense burden though. Were it not so deadly for the Jews in Israel at the moment we might think it just that, a schoolyard spat. But this goes all the way back to Isaac and Ishmael. Reconciliation will only come when the Teacher appears in the schoolyard. The violence is real and deadly, which makes this particular “parve” demonstration stand out. Would that all our conflicts were this low-key. I foresee a time when there will be no conflict at all.